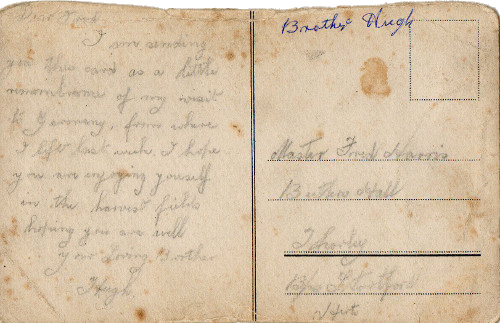 Addressed to Master Fred Harris, Butler's Hall,Thorley, Bishop's Stortford, Herts. Message - I am sending you this card as a little remembrance of my visit to Germany, from where I left last week. I hope you are enjoying yourself in the harvest fields. After being wounded in the knee on 26th March 1918, Hugh Harris was taken prisoner and treated in various hospitals, prior to being repatriated in August 1918. 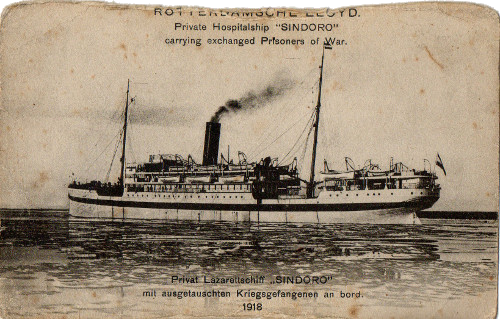 On his journey to Edmonton Military Hospital, his train stopped at Bishop's Stortford Station where he handed the postcard to someone for delivery to his younger brother Fred. His leg was subsequently amputated at the hip and he died at Edmonton Military Hospital from tubercular meningitis on 16th July 1919 aged 20 years. He was buried at Thorley on 22nd July 1919. Hugh and his elder brother George were both wounded and captured within a week of each other. George was shot through the lung and lay in a shell hole for four days and nights before capture. The family would therefore have had notification of two sons missing in action within a few days of each other.